As a matter of fact Meditation Series of incense sticks has regularly been used for centuries across different religions and faiths be it Catholic, Jewish, Buddhist, Hindu or most others. One of the most vital reasons why Meditation Incense Sticks are used is that, it purifies the air and has an amazingly soothing effect on the mind. Just like candle brightens up a darkened room, the aromatic effect of Meditation incense sticks offer tranquility to the senses. we believe that this incense has several medicinal effects too. In fact many earlier civilizations used Meditation Incense for meditation and as a herbal medicine for treating health disorders. 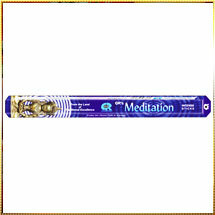 Our Meditation Incense Sticks are available at reasonable prices.